ELMSFORD, N.Y. (June 20, 2018) – Following a renovation completed in early 2017, a new-look Meadow Brook Club in Jericho, N.Y., is set to challenge the Met Area’s top amateur competitors, June 25-26, in the 63rd Ike MGA Stroke Play Championship Presented by Callaway. The championship perennially features the region’s deepest field of amateur talent and stands as the MGA’s first major of the season. This year, six qualifying rounds were held throughout the Met Area to help fill out the final 135-player field. Reigning champion Matt Lowe of Colonial Springs, who won with a course-record 61 at Century in the final round, headlines a number of players in the field that claimed MGA titles in 2017. The list also includes Alex Kang (Public Links), Matt Mattare (Amateur) of Darlington, Jake Mayer (Junior) of Plainfield, and Ethan Ng (Carter Cup) of Fiddler’s Elbow. A number of players have already earned titles in 2018 and aim to continue their early roll at Meadow Brook. Jonathan Jeter of Nassau Players has already notched a pair of wins, taking both the Havemeyer and MGA Public Links. Others with wins already this season include Trevor Randolph (NJ Mid-Am) of Arcola, Christian Cavaliere (Westchester Amateur), and Dan Macdonald (Hochster) of Arcola. Meadow Brook last hosted the Ike in 2003, when Brad Tilley earned the title. Tilley, of Sleepy Hollow, made his return to amateur golf last season and quickly made his presence known. Locally, Tilley finished as runner-up in the Westchester Amateur and the MGA Mid-Am, while also medaling and making a run to the quarterfinals in the U.S. Mid-Am. James Nicholas of Westchester is the lone player in the field to have earned top-10 finishes each of the last two years (T5, T7) at the Ike. Last year’s T5 finish helped spark an outstanding season for Nicholas, which led to 2017 MGA Player of the Year honors. Nicholas carried momentum into his junior campaign at Yale, capturing his first collegiate title at the Cornell Invitational and earning Ivy League Player of the Year honors. The field contains a strong representation from rising stars in the collegiate ranks, including recent Cornell graduate and four-time All-Ivy honoree Michael Graboyes of Watchung Valley, Jeremy Wall (Loyola) of Manasquan River who finished as runner-up in the Patriot League Championship, Dawson Jones (Rhode Island) of Jumping Brook, Evan Grenus (Wofford) of Sterling Farms, and Ryan Davis (Penn State) of New Jersey National. Most of the top-10 finishers from the 62nd playing are back again, once again eyeing a top finish. Those include Thomas LaMorte (T2) of Haworth, Mattare (T2), Sam Goldenring (T5) of Brooklake, Nicholas (T5), Chris Gotterup (T8) of Rumson, Reid Bedell (T8) of Manasquan River, and John Felitto (T8) of Echo Lake. Host club Meadow Brook has two competitors in the field: Steve Lessing and William Ahmed, with Lessing being the 2017 Club champion. Founded in 1881 around polo; first nine-hole course completed in 1894 and Devereaux Emmet designed 18-hole course that opened in 1916. Double dogleg par-five 8th once called “best extra-long par five in the country,” by Byron Nelson. 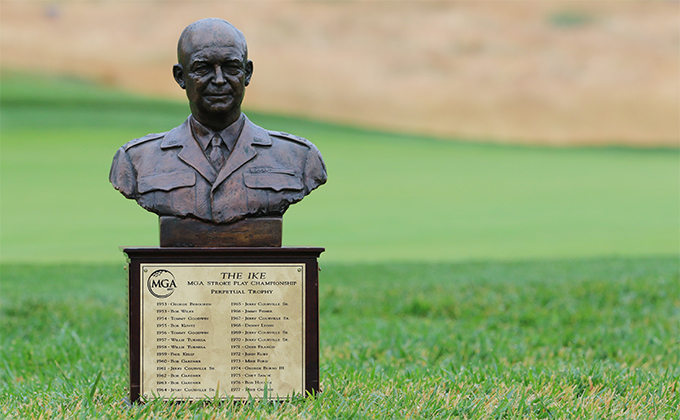 One of 16 Met Area clubs to have hosted all three of the MGA’s majors—the Ike, Amateur, and Open. Hosted Ike in 1997, 2003; Amateur in 1947, 1960, 1987; and Open in 1977, 2007. Hosted Champions Tour’s Long Island Classic from 1988 to 2002. Live hole-by-hole scores for the majority of groups during the final round, Tuesday afternoon. Scoring, recaps, interviews, and photos on mgagolf.org.